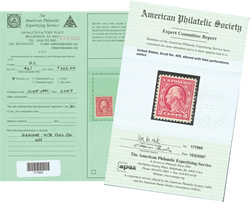 Now you can search and view the opinions of stamps and covers that the American Philatelic Expertizing Service has examined. At present you can view images/opinions from 2004 to 2009 and from the summer of 2014 to date*. *Records are constantly being added to the data base so check back regularly for up-dates. please contact Tom Horn, APEX Director at twhorn@stamps.org.